Image science investigates the ways that image quality can be defined, measured and optimized; it touches and improves the visualization of everything from healthy bones to unstable atmospheres to millennia-old geological formations. This interdisciplinary field studies the physics of photon generation, the propagation of light through optical systems, signal generation in detectors and more, and considers the statistics of random processes and how they affect the information contained within images. The faculty in image science at the College of Optical Sciences show particular strength in designing new technology for medical imaging, homeland security, earth sciences and other applications, and in developing new methods for assessing image quality by quantifying how accurately imaging systems can accomplish certain analytical tasks. To view past updates, see the Image Science Update Archive page. Left: Compressive imager prototype. 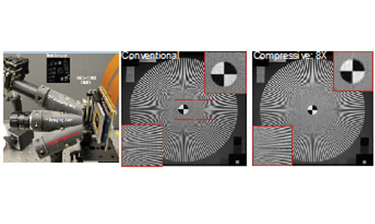 Right: Images from traditional imager and prototype at eight times compression. As imaging devices — from smartphones to military drones to security cameras to cars — become ubiquitous, rising data volume and processing demands become problematic. Compression is routinely employed to reduce image file sizes for convenient storage and transmission. However, the success of image compression techniques suggests that traditional imaging systems can be highly inefficient, collecting redundant data that could be compressed without significant degradation. The field of compressive imaging addresses this shortcoming by acquiring a “compressed image” directly in the optical domain. One direct benefit of such optical compression is that it employs energy-efficient low-resolution sensors, rather than the power-hungry high-resolution image sensors typically found in traditional high-quality cameras (e.g., digital single-lens reflex cameras). 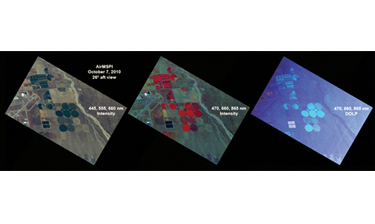 The prototype shown above, developed by Amit Ashok’s Intelligent Imaging and Sensing Laboratory under U.S. Army and Defense Advanced Research Projects Agency programs, is capable of forming high-resolution images using a low-resolution sensor and a programmable spatial light modulator. Compressive imaging has the potential to make significant impacts in spectral bands (e.g., infrared, terahertz), where sensor costs and complexity dominate camera design. 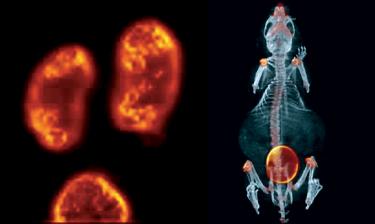 Left: High-resolution mouse kidney and bladder SPECT image acquired with cadmium-zinc-telluride gamma-ray pixel detectors. Right: Coregistered mouse SPECT/CT image acquired with FastSPECT II and FaCT (adaptive X-ray computed tomography) systems. Nuclear imaging modalities, such as positron emission tomography and single-photon emission computed tomography, form an important element of modern medical diagnostics. The University of Arizona Center for Gamma-Ray Imaging, led by Harrison H. Barrett in cooperation with Lars R. Furenlid, Matthew A. Kupinski and Eric W. Clarkson, focuses on advancing the state of the art in radionuclide imaging (e.g., PET and SPECT). The CGRI uniquely combines rigorous theory, inventive computational tools, advanced detectors and electronics, innovative imaging systems, novel radiotracers and cutting-edge clinical and preclinical applications. This work is done within the context of gamma-ray imaging, but it is important to other forms of medical imaging and image science in general. The collaborative research supported by the CGRI applies these new imaging tools to basic research in functional genomics, cardiovascular disease and cognitive neuroscience, and to research in breast cancer and surgical tumor detection. An exciting direction of research in the center is examining multimodal and adaptive imaging systems. A multimodal imaging system becomes adaptive when the information from one system is used to modify a second system before data is taken with it. For example, the first system (MRI or computerized tomography) may be used to locate regions of abnormalities, and then the second system (SPECT or PET) can be modified to focus on these regions for functional imaging. They also specialize in developing and applying advanced X-ray and gamma-ray detectors and commissioned SPECT, PET and X-ray CT imaging systems. They study the physics of scintillation and solid-state detectors and the design of pulse-processing electronics, digital data-acquisition systems, and data inversion and reconstruction with a variety of computational methods. AirMSPI image showing surface features that show up preferentially in the degree of linear polarization image. The polarization of scattered or reflected light from an object carries information about its material characteristics. Russell A. Chipman’s Polarization Laboratory specializes in developing precision polarimeters that measure from the ultraviolet to the short-wave infrared. When configured as imaging devices, these polarimeters can produce research-grade spatial and angular resolution for sample characterization. With polarimetric accuracy of 0.1 percent, the instruments are ideal for precise optical characterization, such as measuring the concentration and distribution of aerosols in the atmosphere. 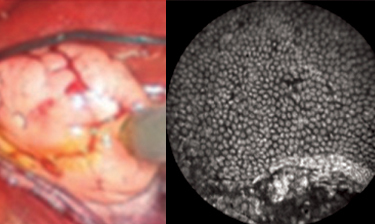 Left: Confocal microendoscope imaging probe in contact with an ovary surface during a laparoscopic procedure. Right: Fluorescence image obtained from the probe showing individual nuclei of cells on the epithelial ovary surface. Optical imaging techniques are now frequently employed for medical diagnosis. A familiar example is biopsy, where a pathologist observes an excised tissue sample under an optical microscope to diagnose a disease. The discipline of optical biopsy takes an optical instrument (e.g., a confocal microscope) in a miniaturized endoscopic form directly to the tissue in need of evaluation. Optical biopsy allows real-time in situ analysis with greater ease and, potentially, increased accuracy. Arthur Gmitro’s research group has pioneered the development of fiber-bundle-based fluorescence confocal microendoscopy, building systems to image a variety of endoscopically and/or laparoscopically accessible organ sites. The instrument shown in the figure at above left is being clinically evaluated for its ability to identify early-stage ovarian and fallopian tube cancers. Matthew A. Kupinski's Image Science Laboratory explores concepts in objective image quality assessment and applies them to diverse areas, including diffuse-optical imaging, clinical CT imaging and national security arenas. His team has developed novel models of imaging systems that make the most efficient use of scattered light, combining task-based imaging with radiative-transport models of light propagation to allow all acquired data to be used when performing a scientifically relevant task. In addition, the Image Science Lab has applied task-based measures of image quality to homeland security imaging, wherein large-scale imaging devices search for sources of radiation in urban environments. 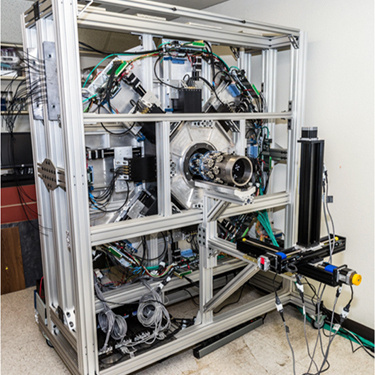 These promising techniques have led to collaboration with Sandia National Laboratories and the U.S. Department of Energy on the development of imaging systems for confirming nuclear-treaty disarmament. In addition, Kupinski’s group has worked with a number of commercial system manufacturers to bring image-science concepts out of the university environment and into the commercial realm.